A collaboration between Grasshopper Manufacture’s LET IT DIE and Wargaming’s World of Tanks is currently in the works. The unexpected mashup will bring World of Tanks skill decals to LET IT DIE. The possibility of more unannounced features was teased, but details were not given. Both titles are available digitally. LET IT DIE is available on PlayStation 4 whereas World of Tanks is available on PC, Mac, PlayStation 4, Xbox One, and Xbox 360. For more information on both titles and their collaboration, check out the press release below. El Segundo, Calif. – Sept. 25, 2017 – GungHo Online Entertainment America announced last week at Tokyo Game Show (TGS) 2017 that Grasshopper Manufacture’s widely popular free-to-play hack-and-slash sensation, LET IT DIE, on the PlayStation®4 computer entertainment system will have a collab with Wargaming’s hit, free-to-play gaming marvel World of Tanks. With its tactical warfare-based gameplay and dedicated MMO features, World of Tanks will invade LET IT DIE with exclusive new collab skill decals with the possibility of other unannounced features. Wargaming is known for its iconic warfare games World of Tanks, World of Warplanes, and World of Warships. 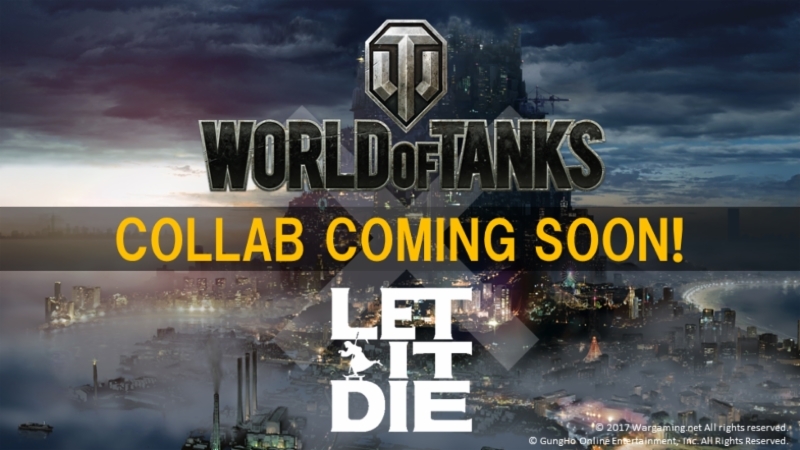 The World of Tanks collab will be coming to LET IT DIE later this year. LET IT DIE continues bringing vast amounts of content for players such as BLACK THUNDER, the third of four FORCEMEN revealed via livestream and the newest updates to Tokyo Death Metro, the game’s asynchronous multiplayer mode. Back in April, LET IT DIE debuted the first of four FORCEMEN, WHITE STEEL, in a livestream outlining major changes coming to LET IT DIE in the second half of 2017. Meanwhile, RED NAPALM was revealed as a follow up FORCEMEN in July. LET IT DIE has passed three million downloads in North America, Europe, and Japan. GungHo Online Entertainment America, Inc. (GOEA) is a multiplatform publisher dedicated to delivering the best titles, content, and support for the online gaming community. Established in 2012 and led by former Square Enix and XSEED Games executive Jun Iwasaki, GOEA is the US division of GungHo Online Entertainment (GOE), an established Japanese publisher. GOEA’s content partners include leading developers Grasshopper Manufacture, Game Arts, Acquire, and Gravity, all of which are subsidiaries of GOE. GOEA publishes and distributes network-oriented games for console, handheld, mobile, tablet, and MMO-style games for PC. GOEA is located in El Segundo, CA. For more information, visit www.gunghoonline.com. Wargaming is an award-winning online game developer and publisher and one of the leaders in the free-to-play MMO market. Founded as a privately held company in 1998, Wargaming has shipped over 15 titles. Currently, Wargaming is focused on its team-based MMO war series dedicated to the mid-20th century warfare that includes the armored World of Tanks, the flight combat World of Warplanes, and the naval World of Warships. The three intertwined titles form a common gaming universe integrated within the portal www.wargaming.net. As part of its multiplatform line-up, the company has introduced World of Tanks on Xbox and World of Tanks Blitz on mobile platforms, Windows 10 PCs and Mac OS X. Launched in 2014 and 2015, World of Tanks on Xbox introduced epic tank-on-tank battles to console gamers and offers the first cross-platform gaming experience between Xbox 360 and Xbox One. In 2016, Wargaming released World of Tanks for PlayStation®4, continuing its console campaign. Official website: http://www.wargaming.com.